Earlier this year, TFM and Allsteel conducted a survey of facility managers to find out about their attitudes with regard to the sustainability movement. Just this past week, the International Facility Management Association released the results of another survey on this topic. 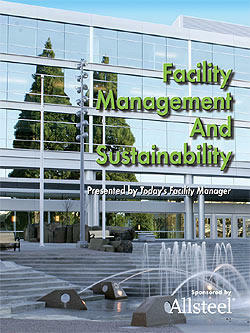 According to IFMA’s survey, facility management professionals report a continued increase in the use of green building practices. The vast majority, 70% of those responding to the online survey, reported implementing green concepts within their organization’s facility. Using natural daylight, purchasing recycled office products, water conservation, participation in incentive programs offered by local utilities or state/provincial agencies, and adding environmental criteria to the vendor and product selection process topped the list of the most common green building practices. Other steps in place or considered pending implementation in the next two years include lighting fixture retrofits, light sensors, employee education programs, and Energy Star. Energy Star is a U.S. Environmental Protection Agency program that measures current energy performance, sets goals, tracks savings, and rewards improvements. This energy performance rating system is already in place at more than 21,000 buildings across the country. When asked about the motivation behind implementing green policies, facility managers reported concern for improved employee health and productivity, cost savings, environmental responsibility, reduced liability and life cycle cost strategy. Slightly of less importance were public opinion and corporate or government mandates. Compared to the 2002 survey results, there has been a 3% increase in those who have reported adhering to a master plan to implement all feasible green concepts. 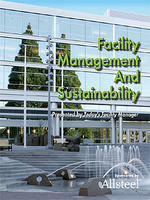 In this year’s study, the majority of facility managers, 59%, reported implementing selected green building concepts, unguided by a master plan; 11% are following a master plan to implement all feasible green concepts; 17% haven’t implemented any green strategies, but will do so within the next two years; and 13% haven’t implemented any green strategies, and do not plan to do so. The data for this study was based on 341 respondents to a Web-based questionnaire sent to 3,510 U.S. and Canadian professional members of IFMA on May 12, 2005.